Volunteer opportunities at Winship are all patient-focused. Each position plays a vital role in Winship's focus of providing quality patient care and assistance to each patient, as well as their family members and caregivers. As a Winship Cancer Institute volunteer, your positive-minded involvement and genuine concern can work wonders for our patients. You can change a patient's emotional outlook, give hope to a family, or simply provide a helping hand so that our staff can focus on the patient's care and treatment. Current volunteer opportunities are available at the following locations: Winship Cancer Institute (Clifton Road campus), Emory University Hospital Midtown, Emory Proton Therapy Center, Emory Saint Joseph's Hospital, and Emory Clinic at Buford. 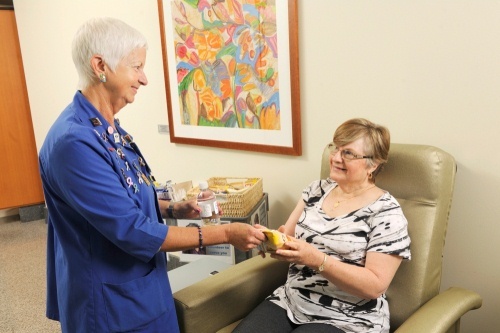 Volunteer opportunities are available in the areas of Ambulatory Infusion Center, Bone Marrow Transplant/Hematology, Medical Oncology, Patient & Family Resource Center, Radiation Oncology, Radiology, and the welcome/concierge desks. Do you sing or play a musical instrument? Volunteer to share your talent as a group or individual with the patients, family members and caregivers at Winship. Immunizations from Emory Employee Health. All volunteers are required to receive a seasonal flu shot during the months of September – March. In addition all volunteers will be required to take an annual TB test. Volunteer uniform to be worn during your volunteer shift. NOTE: A $25 uniform payment is required by each volunteer. Commit to fulfilling a 6 month period of volunteer service with a minimum of 8 hours per month (the equivalent of two 4 hour shifts per month). In addition to the above requirements, volunteers who are cancer survivors are required to have been out of treatment for at least 6 months prior to volunteering. Additionally, volunteers who have had a family member recently pass away from cancer will need to delay volunteering for at least 12 months. We will work with you to place you in a volunteer position that fits your interests, experience, and desired level of patient contact. Step 1: Review the volunteer benefits listed above. Step 2: Review the volunteer requirements listed above. Step 3: Review the Online Volunteer Manual (PDF). or higher on the Online Assessment to be eligible to volunteer. For more information, please contact Volunteer Services at (404) 778-2405. Current and active volunteers can access and manage their volunteer account and schedule by logging in below using their username and password.